A congressman who opposes legislation to expand surveillance powers is killed by a rival. The murder is accidentally recorded by a wildlife researcher who passes the footage on to an unwitting friend, lawyer Robert Clayton Dean. With the NSA after the video at all costs, Robert becomes an enemy of the state. 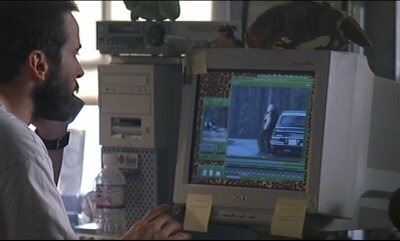 Wildlife researcher Daniel Zavitz uses the Sun to watch his video footage of the murder and to record it onto a PCMCIA card that he then hides in a TurboExpress handheld games console. There's a lot of unrealistic video zooming, and David writes to the PCMCIA card using the Sun's floppy disk drive!